I'm looking for a used AirPort Extreme. In all the usual places - eBay, Craigslist. I'll probably get one this week. Why? It's a long story. A while back, I picked up an AirPort Express A1084 router on Craigslist, and found that it was incompatible with my AirPort Utility and wireless-n network, even though it looked *identical* to the current model of AirPort Express. So, I wrote a post on this blog about the different types of AirPort Express routers, noting that if you're looking for used Airport Express routers to extend your AirPlay network, you'd better seek out model A1264. 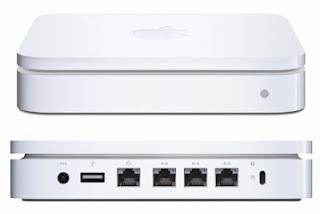 In the months that followed, Apple updated the AirPort Express again, changing the form factor (it looks like a little white AppleTV now), adding simultaneous dual-band support, and giving it model number A1392. ASIDE: I'm not totally convinced that the form-factor change was an improvement. The A1264 plugged directly into the wall, which was incredibly convenient, but the A1392 has a power cable and sits on a flat surface. I'm constantly picking up AirPort Expresses - they can be configured to extend your wireless network throughout your house, and each can turn a radio or speaker into an AirPlay device. They're great. But I don't use an AirPort Express as my primary router. Our primary router is a 1st generation Time Capsule. It gets the job done, and I'm happy that there's a second disk backing up our photos and music. But the thing runs *constantly*. Incremental backups every hour. Full backups every day, with a month of them stored - and weekly backups stored forever. All wirelessly. That's a lot of traffic on the old wi-fi network! And almost every day, I'm greeted with a "!" in the Time Machine icon in the system tray, because some backup was delayed due to network issues. I'd really, really like to get this Time Capsule hard-wire connected to the iMac via Ethernet, and rely on an dedicated AirPort Extreme as the primary router. So, I'm used-AirPort Extreme shopping. And it's substantially more confusing than Airport Express shopping. The AirPort Extreme has gone through a two different form factors. 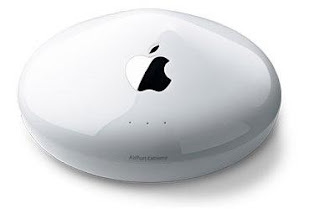 Back in 2003, the AirPort Extreme was a round, blobby little B/G router... we're obviously not looking to buy this one now, and it's easy to identify. These are known as the "Original" or "Round" generation AirPort Extremes. We can probably ignore them moving forward. In January 2007, Apple added Wireless-N capabilities, and changed the design to the form factor we know and love today. It's a white, rounded square, LED on the front, 4 ports on the back, Apple logo on top. Of course, when you consider that the exact same form factor has been in play for seven years and 5 generations of product, it becomes tricky to remember which router is which, when you're scouring eBay. Each generation of AirPort Extreme has gotten a little bit more powerful in terms of output power - but they've also added interesting features along the way. They also have difficult naming conventions - both have a "model number", which is in the "A11XX" format - and a "name", which is a string of characters like "MC340LL/A". This article focuses on the model numbers, because they're simpler. If you want to make sure you're buying the right router, you need to know the differences. The January 2007 version was known as the "1st Generation" AirPort Extreme. Model number A1143. And then things get confusing. You should probably start taking notes. The "Second Generation" AirPort Extreme - still known as model number A1143 - came out in August of 2007 and added Gigabit Ethernet. The "Third Generation" AirPort Extreme - Model number A1301 - was released in March of 2009, and added simultaneous dual band (i.e., Wireless-N at both the 2.4 and 5 Ghz range). It moved to a 2x2:2 MIMO (multiple in, multiple out) antenna configuration, which increased speed. It also added one REALLY cool feature: the Guest Network. Now, you could have a home network for your own devices, and a completely separate network for your visiting friends. This is the main feature I'm looking forward to adding - I'm wary of giving out my password to every single person who comes over. Now if only I could get a "Guest Network Authentication" webpage to pop up on visitors' screens, like I was a hotel or a Starbucks.... that would be cool. Just seven months later, in October 2009, Apple released the "Fourth Generation" AirPort Extreme - Model number A1354. For the 4th generation, Apple moved to a 3x3:3 MIMO configuration. That extra data stream increases speed once again. The IPv6 router mode on the AirPort Extreme may (depending upon your ISP) enhance performance, and (no matter where you are) future-proofs your router for when all networks require IPv6. The latest version of the AirPort Extreme is the "Fifth Generation" model - number A1408 - which was released in June 2011. "Sixth Generation" - Wireless-AC, New Form Factor. 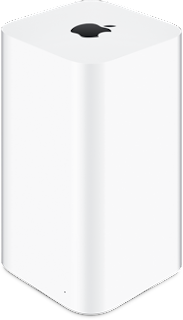 The Sixth Generation Airport Extreme (and new Airport Time Capsule), introduced in June 2013, is a 4" by 4" square, six and a half inches high. It introduces the Wireless-AC standard (at the moment, only really available in the new MacBook Airs that were also introduced at WWDC 2013) and bumps up the antenna count to six - three at 2.4GHz, and three at 5 GHz. My search is currently centered on 4th and 5th-gen AirPort Extremes. I really want the 3x3:3 MIMO, the IPv6 mode, and (most importantly) the Guest Network. A brand new A1408 currently sells for $179.00 from Apple. I'm hoping to get one for around $100, which seems to be average price on eBay. I'd also settle for an A1354 - but if the difference in price is only 20-30, I'll probably go for the current generation. We'll see how it plays out. UPDATE: I got a Fourth Generation Airport Extreme A1354, used, for $90, the day after this article was originally posted in Feb 2013. A year later, it's still working phenomenally. I never got the Time Capsule to back up the iMac via CAT-5... and then it died. But its internal HD lives on, as a Time Machine drive in an external enclosure, attached via USB. UPDATE 1/26/15: Wow, this is a popular post! It looks like there are a lot of people shopping for used Airport Extremes. I just picked up a sixth generation Airport Extreme, on eBay, for about $110 - a fantastic deal. Now that we have two iPhone 6 in the house, the wireless-AC is being put to use. The A1354 is staying in the family, though - it's off to my parents' house, along with one Airport Express, in an attempt to solve their wi-fi issues. Love your site. I noticed the 6th generation Airport extreme does not support airplay. Does the Fifth generation Extreme? AirPlay streaming is a differentiator for AirPort Expresses and Apple TVs. The ideal Apple Airport network is an AirPort Extreme acting as the primary wi-fi router, with AirPort Expresses acting as wi-fi extenders and music streaming destinations. Just wondering if you know if all the generations will work together? We have the following working together now: Airport Extreme 4th Gen, Airport Express 1st Gen (wired) and Airport Express 2nd Gen extending the network from the 1st Gen. The network was working fine but when we added another Airport Express 2nd Gen wired it would take down the internet and wireless connections would become spotty. Remove this device and all goes back to normal. I have even taking all the other expresses out of the picture and added the new express directly wired to the extreme and ran the setup. After restart the internet connections start having issues. Just wondering if you had any ideas. We have had issues with adding wireless-G only devices, such as the Airport Express 1064, to a wireless-N AirPort network. In fact, the newer versions of AirPort Utility would not even recognize our 2nd Gen express wirelessly. Obviously, your mileage May vary - but it sounds like youre having even more problems than we did. Probably not worth the hassle to extend a network with G-only... But still holding some value on eBay. OMG! Kevin, I have been pulling my hair out dealing with the exact issue you have described while attempting to set up a wi-fi network for a client. 4th gen extreme for main firewall/gateway/router/access point. 1st gen express connected to an ethernet port on the extreme happily creating a second wireless network in the tenant apartment. Tried but could not get a 2nd gen express set up to extend the original wi-fi network no how no way. Once the 2nd gen express was "configured" the entire network became unstable. Have been forced to use an old 1st gen extreme they had(replaced by the 4th gen extreme) connected through ethernet in order to extend wi-fi. As for the 2nd gen express it now resides as part of my home wi-fi network, happily extending my 2nd gen extreme wi-fi network and doing it wirelessly. Go figure? Some more details to throw in: My 2nd gen extreme, the client's 4th gen extreme and the client's 2nd gen express are all running 7.6.3 firmware. This whole thing has soured me on Apple Wi-Fi. I don't like backing up over wireless. It puts a lot of traffic on the wireless network. It's great if you only have one wireless device, but if you have multiple and they all backup every hour, you can bog down the data transmission. I recommend backing up over wired network instead. Just connect a Cat 5 or Cat 6 cable from the router to the computer. So you're saying that people should go buy a Thunderbolt to Ethernet cable for their Macbook Air so they don't have to back up a couple of megabytes per hour of data over wireless? That sounds a tad unnecessary, to me, for something that happens in a few seconds. In your update you say "I got a Fifth Generation Airport Extreme A1354". Isn't that the 4th gen? The 5th Gen, though identical in specs to the 4th gen, added more power output. And the 3rd gen with 2x2:2 configuration versus the 2nd gens 3x3:2 configuration was actually slower by a factor of 2. I should know since I had both and my speeds dropped in half. I returned it and had to wait wait for the 3x3 configuration to return. Good catch! Yes, I have a 4th Generation Extreme. I'll edit that. Why would anyone want to extend via the Ethernet cable, when they can easily extend with the Express using wireless in repeater mode? More reliable and less traffic on the WIFI too. I got a 5th gen from the Apple refurb store for $89. I have an Airport extreme in an attic where it is difficult to get to. I want to identify the model. According to the newest AirPort utility, it has both IP6 and Guest network. Is there a way to figure out if it is 4th or 5th gen without climbing into the attic? IPv6 was a feature of the 3rd gen. Airport Extreme as well. I had an IPv6 tunnel configured on my 3rd gen Extreme (A1301). I changed it for a AVM Fritz!box 3790 (not for sale in the US) because it has much more features. First, I must apologize, this has been covered web wide but none of the published 'solutions' worked for me. I have no fixed land line connection as so rely totally on an uncapped 3g service via a yagi antenna which works well. Plenty of workarounds out there for those that have an ADSL connection but few if any relate to my sole iPhone 5 setup. I followed slavishly the Apple setups for 'extending/creating new and joining' my APExtreme and APExpress with no luck. Given many will eventually ditch the twisted pair I guess this topic will become more frequent. I would appreciate any help or suggestions. Just thanks for all the info about Model Numbers ! excellent work. Our Lynksys has done a nosedive. We are moving from TWC to Verizon FiOS. My wife is going to prefer the Airport Extreme as a router and for storage. I am looking for suggestions how to best serve the several needs -- we sometimes have as many as five Macintosh computers in full operation in this home when my wife has work home, our daughter and son-in-law are visiting but working to fulfill their college teaching obligations, and I am writing/viewing -- and so I am not panicked about spending good dollars for a best result. Ideas/suggestions for which models are most certainly welcome. The "Airport Extreme + multiple cheap Airport Expresses extending the network" model has worked well for us, for several years. You can usually find old form-factor Airport Expresses on eBay for $30 or less, if you're OK with Wireless-N.
By the way, you can adjust the Time Machine backup schedule, once in a hour is overkill for most users. Just google "Change the Time Machine Backup Schedule". I used the command line snippet and it has worked fine for years already. I will give this a shot tonight. We've been through several iterations with our Time Machine - first the drive died, so I swapped it out. Then the Time Machine (but not the drive) died - so I put the drive in an enclosure and added an Airport Extreme. Then we replaced that full-size SATA drive with a small form-factor Toshiba that matches the iMac (stainless and black). Matt - What is the benefit of a IPv6 tunnel? I have my 5th gen set to NATIVE. This is a bit above my level of understanding. IPv6 tunneling is useful during the transition from IPv4 to IPv6, because it allows your router to access websites and web services that it couldn't normally, by "wrapping" the IPv6 content in an IPv4 layer, or vice versa. Before you toss any Apple Airport or Time Machine model, thinking it is dead, do a reset. I typically do the reset where you hold a pen to the little reset button on the back while plugging it in to the power. Wait 6 seconds holding that reset button until the light flashes yellow. There is also a reset newer models can do from Airport Utility. Try that one first, if you can. So far, 100% of the time, it has fixed most messed up networking issues for me. The only thing it did not fix was a first gen Express which, apparently, just burns out eventually. Apple has a web site with instructions on resetting. For anyone who has an original Express version - there is an Applescript launcher that will allow you to use an old version of the Airport Utility (5.6.1) to access and control them. Works fine for me, and despite others voicing concerns about the security of this I really don't think there is any issue from what I can see. Use either version of the utility as required. Yes! I use this regularly. 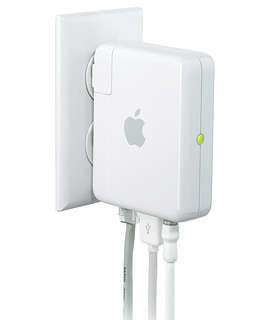 As well as allowing connection to the old Airport Express, it also connects to more recent Express and Extreme versions, and has the added benefit of giving access to the radio power setting. I dial ours down to 10% or 15%, preferring to have multiple wireless access points operating at low power, rather than one nuclear reactor irradiating the whole house. There are features that will allow you to adjust the depth of the bit, which will determine how deep the cut will go.Good posting. Nice..keep up the good work , hope your now in my reading list. Thank you so much. Thank you, Clare! I'm pleased you found the information useful.Good writing author. I've come across this page looking for a comparison between 2nd and 5th generation of Time Capsule (that's nowhere to be found). I have a 2nd gen one that still works (both as a router and a backup disk) after over 6 years, but I have been wondering about an upgrade. Any advice on that? Is it worth it? Any significant differences in speed? Or is it better not to replace it if it works? Sorry for the late response. I had an early-gen Time Capsule, which suffered 2 separate deaths - first the HD, which I replaced, and then the power supply, which I didn't. Generally, the Time Capsule added capabilities at roughly the same pace as the Airport Extreme - i.e., the current-gen Time Capsule offers faster wi-fi performance (wireless ac), an improved antenna array, and so on. But yeah, if it still works, I'd probably keep using it! Thanks for all the information about Model Numbers ! Very useful indeed. I came across this post today while looking to compare the 5th and 6th gen Ariport Extreme. My 6th kinda crapped out when the house was hit with lightening and I got a 5th from goodwill for $10. It works great. I also got a 4th-gen from a thrift store for $5. I want the 802.11ac eventually, but for now this'll work fine. I bought the Airport Extreme today but could I still use my old airport extreme 1st generation as well? I love Apple products but hate the iOS updates - it usually messes up my system! Argh! Is there a way that updates keeps my current settings instead of re-doing it every single time I do the update? 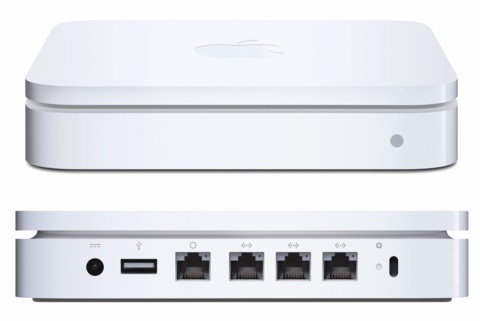 Will the AirPort Extreme device work with a non apple product? My DSL box is also the wireless router. Will it work with that?